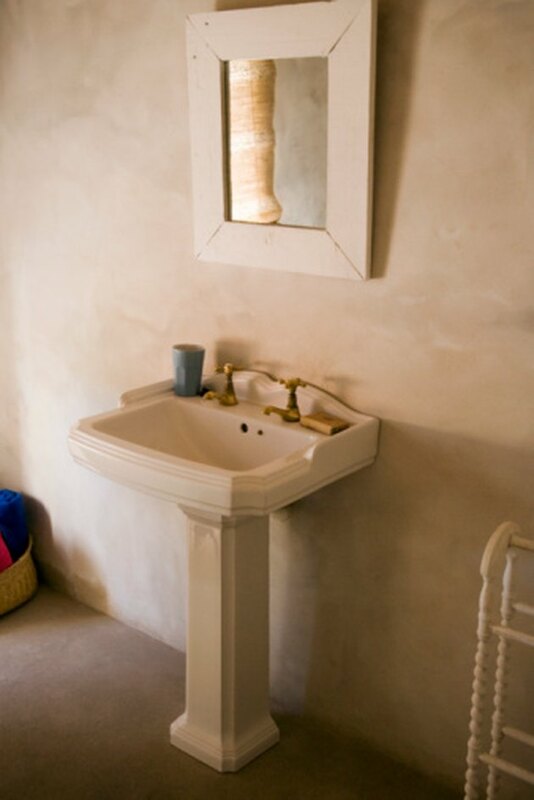 The simplicity of a pedestal sink, with its curvy basin, adds a touch of understated elegance to a bathroom. However, one potential downside to this type of fixture is the fact that it may leave exposed plumbing. If the plumbing is old and rusty, this detracts from the room's appearance. There are several methods for hiding the plumbing for a pedestal. Some pedestal sinks come with a base that hides the plumbing. Install a pedestal sink that has a stand designed to conceal the plumbing. In some cases, you may be able to use your existing sink basin and only replace the stand. Call a plumber if you are uncomfortable with this type of project. Place a small folding screen around the base of your pedestal sink to hide the plumbing. Keep in mind this will also hide the sink's stand, but you can use the area behind the screen for extra storage. Conceal the plumbing fixtures on your pedestal sink by wrapping them with decorative objects such as fake vines or ribbons. Use wide ribbon for faster installation. Wrap the objects around the pipes from top to bottom. Cover the area beneath the pedestal sink with decorative accessories. Place tall ceramic or glass vessels on either side of the sink base to cover the pipes. Arrange tall potted artificial plants in a formation on the floor around the sink. Paint the plumbing so it blends into the wall behind the pedestal sink. Affix a cloth sink skirt that fits around the basin to hide anything that lies beneath. Peel off the adhesive backing at the top of the skirt and press into place around the pedestal basin. Use the area behind for storage space.